Mallorca is an island measuring approximately 70km by 100km with a huge diversity of scenery - mountains, marshland bird habitats, and beaches along 965Km of coastline. Palma, the capital of Mallorca has a waterfront that is dominated by the Gothic Cathedral and is home to more than half the inhabitants of the island. The cathedral is a truly impressive structure whether viewed from the outside or in. The interior has benefited from the work of Gaudi. Around Palma, in the Badia de Palma (Palma Bay) there has been a large amount of development for tourists, from Arenal in the east to Magaluf in the west. 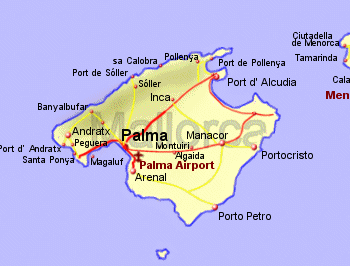 West of Palma Bay is Andratx, an undeveloped town a few Km inland and Port d' Andratx on the coast. The Serra de Tramuntana runs along the northwest coast of Mallorca and creates a very attractive coastline with cliffs and valleys of olives and citrus groves. The town of Soller lies halfway along this coastline with Pollenca at the northern tip. Port de Pollenca, just around the northern tip of the island is a low key tourist resort with a long sandy beach, shallow waters for swimming, and the mountains behind. Most of the north east coast takes the form of a large bay (Badia d'Alcudia) where you will find the Parc Natural de S'Albufera, 8sq Km of wetland representing how much of the bay was before development. These wetlands provide a superb habitat for birdlife. The east coast of Mallorca has a number of narrow coves which are now mostly developed for tourism. Halfway along this stretch of of coastline, Porto Cristo is the largest town and just inland are the caves of Coves de Hams and Coves del Drac.